NPC Headliners Book Event: Andy Parker - "For Alison"
On August 26, 2015 reporter Alison Parker and photojournalist Adam Ward of CBS affiliate WDBJ7 in Roanoke, Virginia were shot and killed while conducting a live television interview for WDBJ’s morning news program, Mornin’. Later that same day Andy Parker, shattered and shaken by the sudden loss of his young daughter Alison, went on Fox News to deliver a solemn promise: to do “whatever it takes to end gun violence in America.” From that day forward, Mr. Parker has worked tirelessly alongside activists like Astronaut Mark Kelly and Michael Bloomberg as an outspoken advocate for national gun reform. 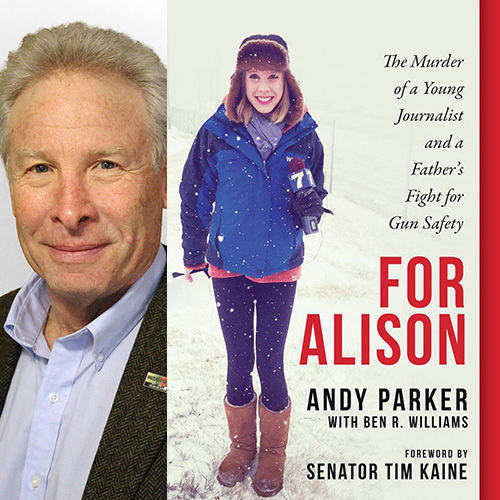 Mr. Parker will share his new book, “For Alison: The Murder of a Young Journalist and a Father’s Fight for Gun Safety,” and discuss how he plans to keep his promise at a National Press Club Headliners book event on Wednesday, March 6 at 6:30 p.m. in the Club’s conference rooms. This event will feature a moderated discussion with Parker, an audience question-and-answer session, and a book signing. Tickets are $5 for National Press Club members and $10 for the general public. When purchasing tickets for this event online, attendees will also have the option of purchasing copies of the book at check-out.